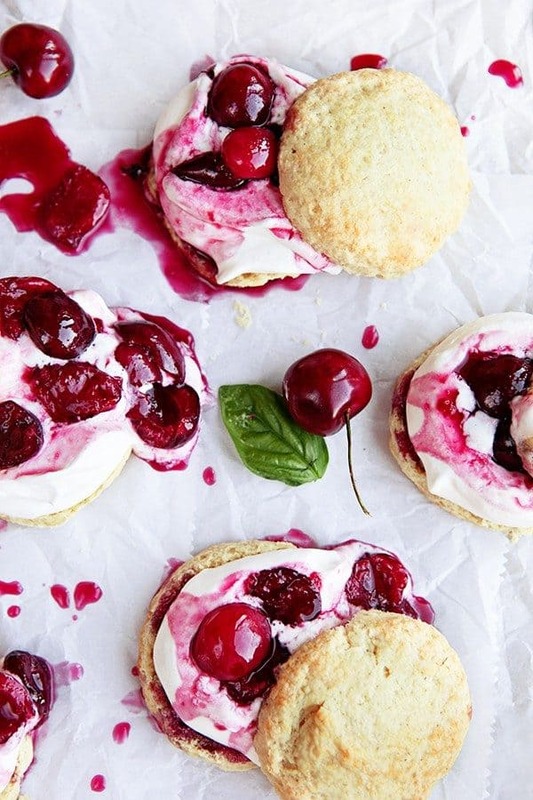 Roasted Cherry Shortcake is a delicious summer twist on an old classic. 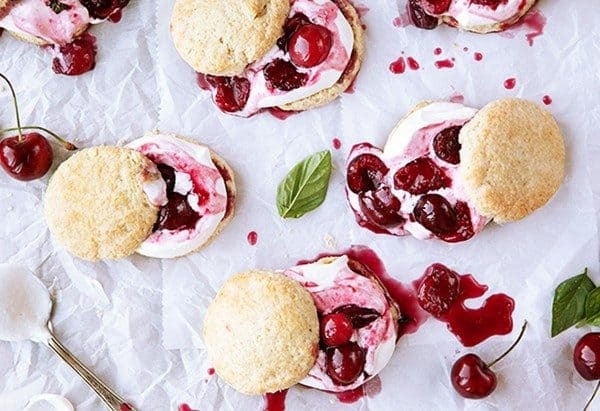 Topped with Buttermilk Whipped Cream and a Sweet Roasted Cherry Sauce, these shortcakes are a revelation. This post has been contributed to My Baking Addiction by the lovely Allison of the blog, Some the Wiser. I hope you enjoy the recipe as much as I do! You’ve surely had a Strawberry Shortcake, but have you tried a Cherry Shortcake yet? Cherry Shortcake is the summer time version of the classic old favorite that everyone loves. Make room in your heart though because this shortcake is awfully lovable. Don’t get me wrong, I love my strawberries. These Strawberry Buttermilk Whipped Cream Puffs have been on repeat since the first ripe strawberries showed up at the market this year. But if orange can be the new black, then I think cherries just might be the new strawberries this month. Right now I am just completely enamored with all the cherries. It all started with this Fresh Cherry Galette, and it’s been cherries on everything ever since. The kids are happy to just eat handfuls of cherries fresh all summer long, which is certainly one of the best parts of summer break. However, I couldn’t help but wonder if those sweet, delicious cherries might be even more enticing if I roasted them. I decided to test that theory in the form of a roasted cherry sauce, with just a hint of fresh basil (because summer, of course). I wasn’t wrong you guys. It’s good. Really good! The list of foods this Roasted Cherry Sauce would be good on could probably go on and on. However, I started it with Ice Cream and ended it with Shortcake. It was tasty on a big scoop of vanilla bean ice cream, but it was downright heavenly on a warm, tender shortcake. I’ve been making (and eating) the Cherry Shortcake ever since. Shortcake by itself is rather unassuming. With vanilla bean and heavy cream, the shortcake is tender with a mild, sweet flavor. It is buttery and soft inside like a good shortcake should be. They’re the perfect sidekick to a delicious berry, or cherry if you will, smothered in cream. Buttermilk Whipped Cream is a quick and easy step up from regular heavy whipping cream. The touch of buttermilk adds a slight tang of flavor to the cream, which pairs so well with the cake and cherries. You can use regular whipped cream, of course, but the buttermilk whipped cream really is fun. The Roasted Cherries, however, are the star of this show. They’re sweet, but not too sweet, and taste like summer down to the last spoonful. The fresh basil is subtle, but I think the hint of spicy flavor it adds is what makes this my new favorite treat. But don’t take my word for it. Pick up a bag of sweet cherries and add this Cherry Shortcake to your menu this summer! 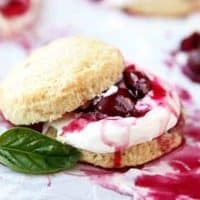 For more delicious cherry recipes, be sure to check out this Cherry Fritter Cake and these Cherry Cheesecake Cookies. Preheat oven to 400 degrees Fahrenheit. Combine all of the ingredients for the Cherry Sauce and pour them in a 9x9 baking dish or pan. Roast for 30 to 40 minutes, stirring every 10 to 15 minutes, until mixture has thickened and cherries are soft. Remove from oven and set aside to cool to room temperature. Lower oven temperature to 375. Line two baking sheets with parchment paper and set aside. To make the short cake: In a medium bowl, whisk together the yogurt, cream, vanilla bean seeds and extract, zest, and egg. Refrigerate until ready to use. In a food processor, combine flour, sugar, baking powder, and baking soda. Pulse twice to mix. Add the frozen butter pieces and pulse until mixture resembles coarse meal and no large chunks of butter remain. Transfer mixture to a large mixing bowl. Pour the yogurt mixture over the top and gently fold it into the flour until the dough begins to come together. When a raggedy dough forms, turn mixture out onto a lightly floured surface. Use your hands to shape the dough, working in the loose pieces. Roll the dough into a rectangle, about an inch thick. Using a 3 inch biscuit cutter, cut dough into circles and place them onto prepared sheet pans. Bake in the center of the oven for approximately 10 to 12 minutes or until the tops are lightly golden. Remove from oven and cool slightly for about 5 minutes. For the Buttermilk Whipped Cream: Combine all of the ingredients in a large bowl and whisk on high speed with an electric mixer until cream is thick and forms soft peaks. Use a pinch or two of cream of tartar to help stabilize. 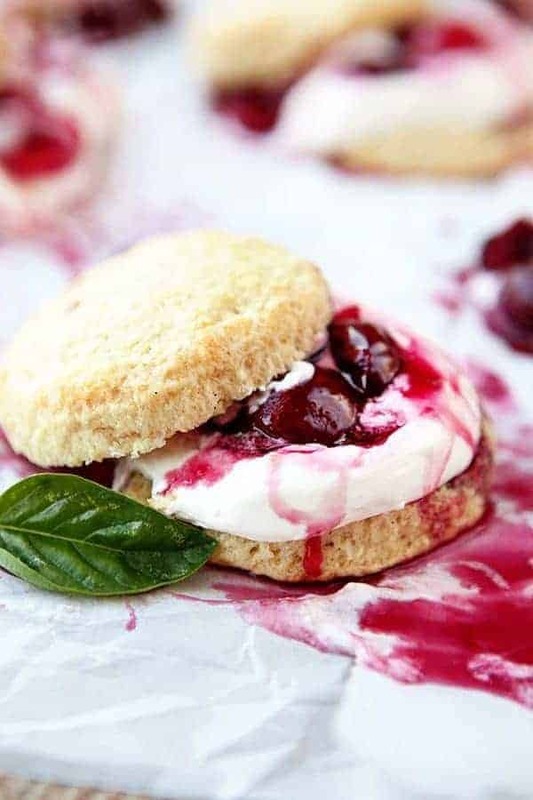 Serve the warm shortcakes with a generous scoop of whipped cream topped with a few spoonfuls of cherry sauce. Garnish with additional basil leaves if desired. Eat up! YUM! Loving this twist on classic shortbread! Hope you enjoy it, Roseanne! Love the idea of the buttermilk addition to whipped cream – totally genius! And roasted cherries are seriously SO good. There’s so much you can do with them! I’ll have to take some extra time to make this cause I don’t wanna mess anything up, it will be my first shortcake recipe at home, I’m super excited! Hope it turns out as delicious as yours! Let me know how you like it, Isadora! Sorry they’re not in weight format. This is something we’re definitely looking into though.